Long before the waterboarding controversy exploded in the media, one CIA agent had already gone public. In a groundbreaking 2007 interview with ABC News, John Kiriakou called waterboarding torture-but admitted that it probably worked. This book, at once a confessional, an adventure story, and a chronicle of Kiriakou's life in the CIA, stands as an important, eloquent piece of testimony from a committed American patriot. In February 2002, Kiriakou was the head of counterterrorism in Pakistan. Under his command, in a spectacular raid coordinated with Pakistani agents and the CIA's best intelligence analyst, Kiriakou's field officers took down the infamous terrorist Abu Zubaydah. For days, Kiriakou became the wounded terrorist's personal 'bodyguard.' In circumstances stranger than fiction, as al-Qaeda agents scoured the streets for their captured leader, the best trauma surgeon in America was flown to Pakistan to make sure that Zubaydah did not die. 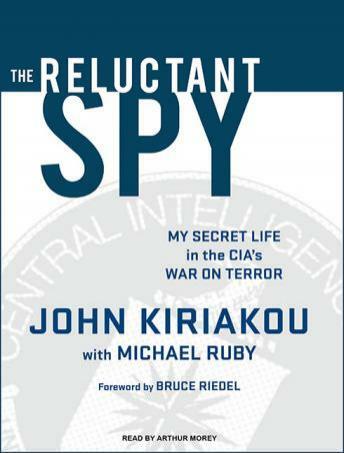 In The Reluctant Spy, Kiriakou takes us into the fight against an enemy fueled by fanaticism. He chillingly describes what it was like inside the CIA headquarters on the morning of 9/11, the agency leaders who stepped up and those who protected their careers. And in what may be the book's most shocking revelation, he describes how the White House made plans to invade Iraq a full year before the CIA knew about it-or could attempt to stop it. Chronicling both mind-boggling mistakes and heroic acts of individual courage, The Reluctant Spy is essential listening for anyone who wishes to understand the inner workings of the U.S. intelligence apparatus, the truth behind the torture debate, and the incredible dedication of ordinary men and women doing one of the most extraordinary jobs on earth. Well, on this very day 1/25/13, John Kiriakou has been found guilty of leaking classified information, and has been sentenced to 2 1/2 years in prison. The judge said she would have given him a longer sentence if she could. As to the audio-book, while interesting, I thought the title of the book was incorrect, it should have been in my thinking 'The Disgruntled Spy'. I found him hardly 'reluctant' as he climbed the ladder in the CIA, just the opposite..... he was always positioning himself to advance in his career. It was a good listen. He had an interesting life but it was not great.